Captain Ahab, who works for private military company Black Lizard, is tasked with carrying out a top secret mission for CIA. 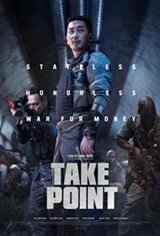 His mission is to infiltrate a secret underground bunker 30m below Korean DMZ and take out a target.The mission immediately derails when the target turns out to be none other than Supreme Leader of North Korea himself, who has incredibly high bounty on his head. Ahab and his 12 men go in for the jackpot against CIA's wishes.Unbeknownst to them, another PMC squad is after the same target and Ahab has to work around CIA's aerial strikes that put him and his men in immediate and present danger.The bunker is demolished and Ahab is in critical condition.When the Supreme Leader suffers a devastating injury, he has no choice but to team up with an elite North Korean doctor to not only save himself but his target and get out of the bunker in one piece.